Beyond 70 degrees is a no-no. The milk starts to taste burnt and sour. Does a man who asks for an 80-degree latte care what a barista thinks about coffee? OK, he was exaggerating. But you get the idea - people think their coffee is being served too cool. They want it hot, especially when they get it back to the office. What about the customer who asks for a 60-degree latte - such as the woman who used to come into Thornbury's Lowlands Espresso (now, I'm sorry to say, closed). ''She came in from day one demanding a 60-degree latte,'' says Lowlands' former owner, Ollie Mackay. ''We were thinking, that's pretty much what we do - between 55 and 60 degrees. I used a thermometer to check for her. ''On the other hand, you get customers asking for extra-hot, and you have to heat the cup and stretch the milk almost past the point where it's safe for the barista to handle it,'' says Mackay. So what's hot and what's not? First, some info from the source - the Istituto Italiano Espresso Nazionale. The institute, based in Brescia in northern Italy, has developed guidelines for espresso and cappuccino - like the Associazione Verace Pizza Napoletana thing. For cappuccino, they say the milk should be steamed to 55 degrees - that's pretty cool, and Australians regularly complain of cold coffee in Italy. Beyond 70 degrees is a no-no, says Jameson - the milk starts to taste burnt and sour. Baristas-in-training use a thermometer, but after that it's the touch method - the milk is right when the jug is too hot to keep your hand on it for more than three seconds. She adds that latte art competitors prefer cooler milk because it is easier to work with, and the judges aren't going to taste it. A couple of things happen when baristas steam milk. They increase its volume by introducing air bubbles, and increase its sweetness by causing suspended lactose to dissolve. As St Ali's Matt Perger explains, we can only taste the lactose's sweetness when it is dissolved. Hotter milk equals more dissolved lactose, which equals a sweeter taste. Perger says the ideal temperature is somewhere between 60 and 63 degrees - below that, and customers complain. So the 60-degree latte lady was on to something. 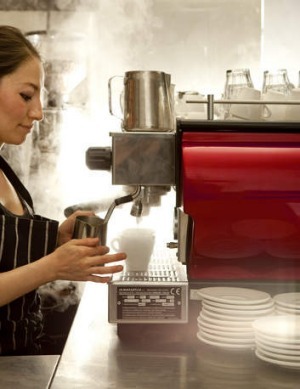 What she and 80-degree latte man would make of the lukewarm 45-degree barista cino served at St Ali - I can only guess. At what temperature do you like your coffee served? 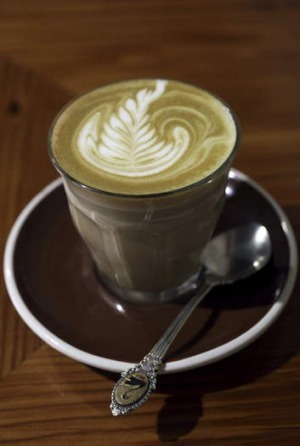 Do you think coffees in Australia are generally served too hot, too cool or just right? Jump on the comments and let us know what you think. The comment on this story judged to be the best by the goodfood.com.au editor will be published in The Feed in the epicure and Good Food print sections on Tuesday and win $100 in prepaid cards courtesy of eftpos. Comments will close on this story at 9.30am Thursday March 13.